Showing off her hair as she loves on Trapp’s dog, Camo. The afternoon started with Jordyn, Lauren and I running into Razzmatazz and getting our hair done. 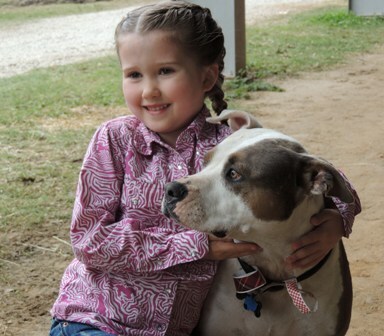 Jordyn’s hair is short but needed to look sleek and hang in pigtails so she could show off the mandatory Leadline bows. As we headed to Katy, we received a text that the horse Jo expected to ride, Ky, was out (too excitable)and she would ride a big, red roan named Red River. By the time we got to the Equestrian Center, we had a new message, that she would ride a huge, black gelding named Heartbreaker (HB) that Caitlyn had been showing in hunters this week. And so preparation began. Caitlyn, Kathy, Lauren, Jo and I walked over to the stall area where HB was housed. Wow-what a horse! Absolutely huge (like as tall as Bruno but stockier and sturdier) and rippling with muscle. Only five years old, but bred for a quiet temperament, beautiful movement and conformation. I doubt Jordyn will ever sit on such an amazing horse again. What an opportunity! We took him over so the braider could start on his braids. 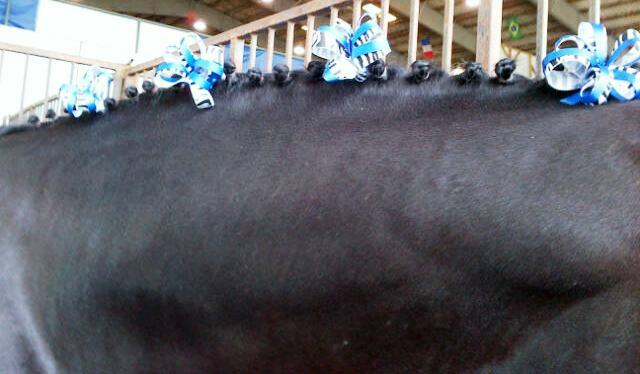 Meanwhile, Kathy and I, attempted to come up a way to showcase the matching ribbons in HB’s mane. I have little skill in anything ‘crafty’. Kathy has deep roots to the business side of things, but perfected four bows of zebra and blue ribbon that contrasted beautifully against HB’s gleaming black coat. The tiny braids on his broad neck with his special Leadline ribbons. Ally, Luke and baby Kendyll got there with Kendyll decked out in a blue onesie saying she was Jordyn’s Biggest Fan. It had Pin Oak 2013 on the back. Then Ally and I got Jordyn ready to go with boots, Jodhpurs, blue show shirt, grey wool jacket, bows, helmet and gloves. 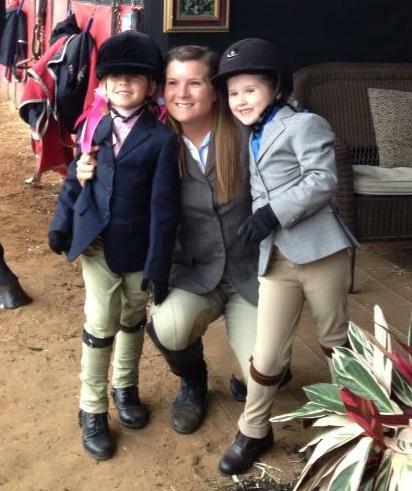 Abby showed up all dressed at the same time and we got adorable pictures of the two equestrians. Jo’s number was supposed to be 860! Lauren attached Jordyn’s entry number to her waist and we were ready to ride. When we made it to the arena, Kathy (I told you she was a number person!) realized Jordyn’s number was upside down. It was more than a little crazy. There was a lot of activity at the in-gate as we waited (and waited) for the girls to be called. But young HB handled it all like the pro he is, and never seemed anxious or spooky. Little Princess was a trooper with Abby as well. Finally, the ring steward waved them through the gate into the massive arena. Leadline was on! Abigail Lacombe on tiny, white Princess and Jordyn Taylor on huge, dark Heartbreaker. What a pair! 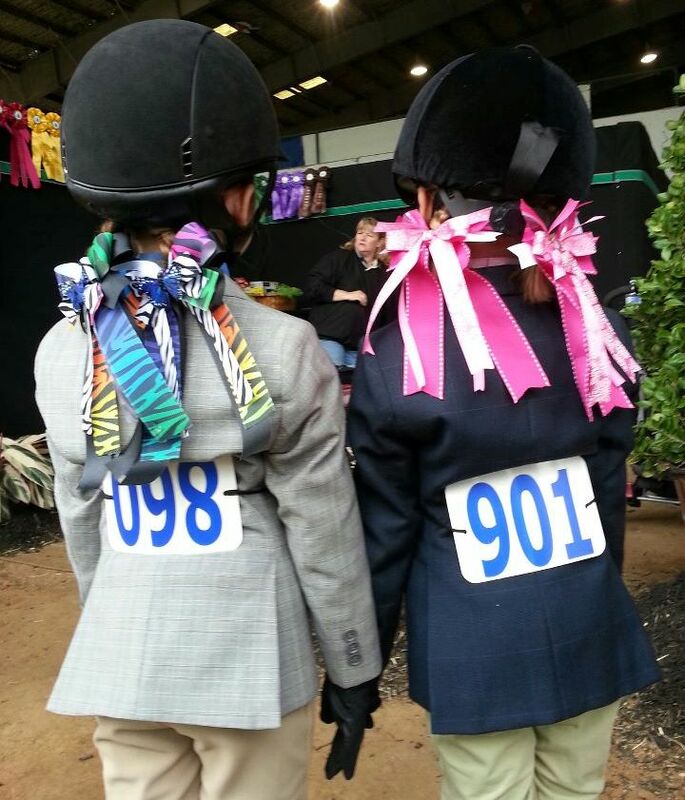 All the little Leadliner’s won a beautiful Pin Oak blue ribbon and a bouquet of flowers. They were greeted by a mass of us upon exiting the arena. I heard Dev’s voice telling the girls what a great job they had done. I caught a glimpse of Trapp, Kathy and Cate’s trainer, who had been instrumental in getting Jo such a great horse to ride, raising his iPhone and snapping a shot of Jordyn and HB. It made me smile! 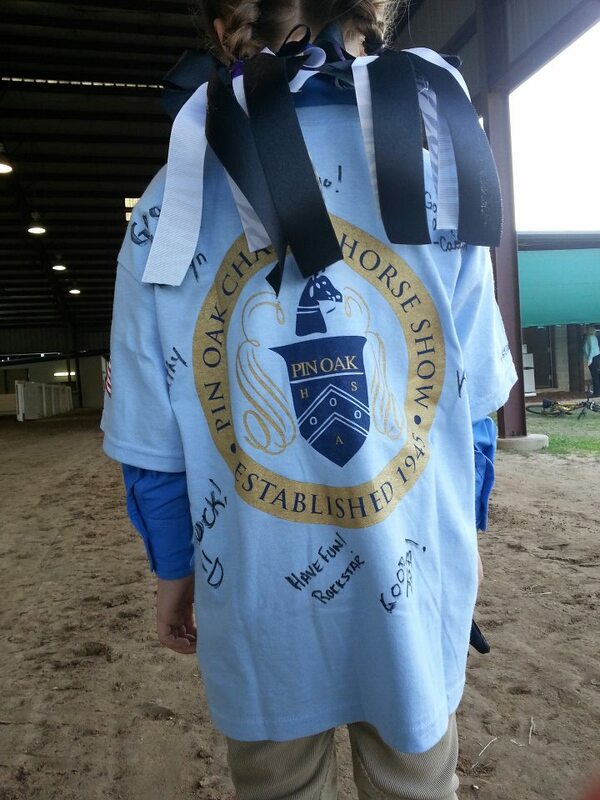 As a special surprise, Kathy and group from Trapp’s barn had gotten Jo a Pin Oak tee-shirt. They had all signed it and sent her well wishes. It was a perfect end to wonderful, wonderful experience. Thank you, from the bottom of my heart to all of you who made this such a special night for my granddaughter, she, and I, will never forget it! I bet this shirt will be cherished for a long time. Caroline, Abby and Princess finally headed back to the barn. This entry was posted in Uncategorized and tagged Dev Branham, Leadline, Pin Oak Charity Horse show, Trapp O'Neal by Exechorseluver. Bookmark the permalink. 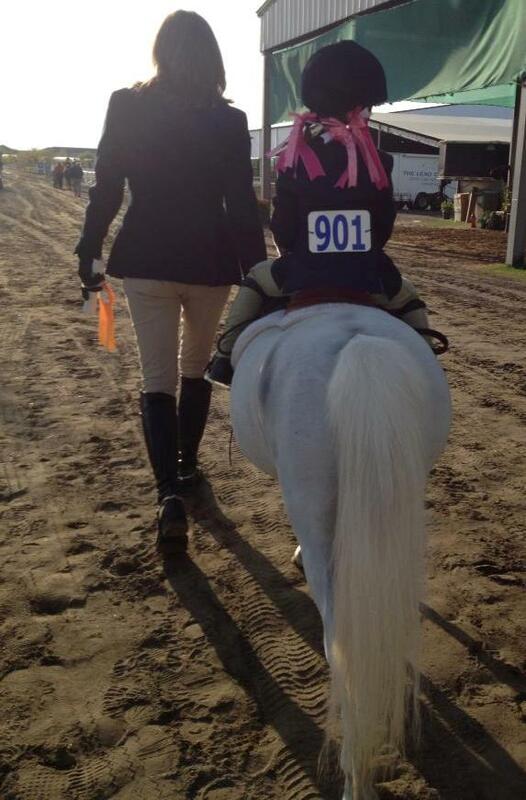 I love the picture of Abby on Princess and Jo on Heartbreaker…really shows the difference in size! Congrats to Jo for handling it so well. Can’t say I could do the same!! So glad it was an enjoyable, memorable experience for all. It was amazing! Looking forward to seeing Riley and Lex. I bet Lexi will love the horses! What Sharie said! 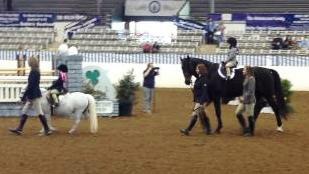 Love kids and ponies (of ALL sizes) and Leadline classes. The Pin Oak Charity Show and their leadline class is legendary. Thank you for letting us share the fun! I love that you keep up with me and my family! Thank you!